MATERIAL: 100% vegan leather (PU) with crosshatch textures. No animals were harmed. The crosshatch material would be a little hard. But it will be more sturdy. There are two back magnetic snap to help expand top closure if you feel it narrow. DESIGN: Belted padlock decoration (not functional) + Fashion tassel + Chain Strap (non detachable) + Two tone color. Top zip closure, flat bottom with studs. Structured design makes it stand up by itself easily. 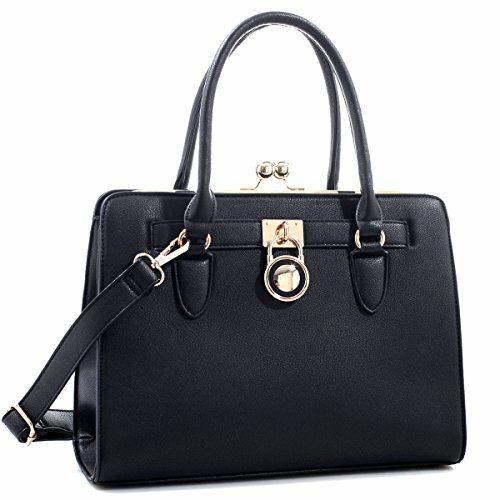 It can be used as a women handbag, satchel bag, top handle purse, work bag, fashion tote etc. DIMENSION: Bag - 13.6 x 10.6 x 6.7 IN approx. Wallet (8 slots) - 7.5 x 4 x 0.8 inches. Weight: 2.5 LB. Handles Drop: 5". Shoulder strap is attached (non detachable). Can fit Ipad, wallet, small tablet, make up bag etc. 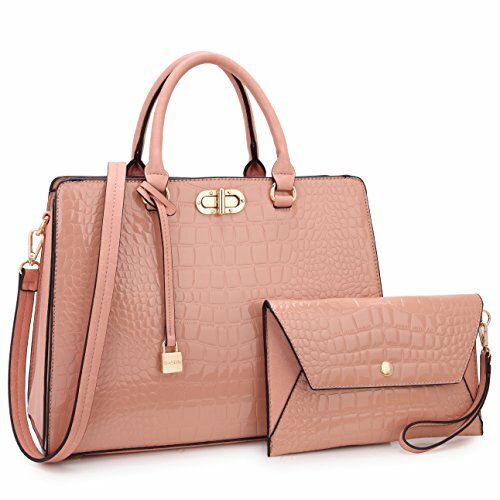 Great handbags set and gift choice for women, ladies. POCKETS: 1 Main Compartment / 1 Interior Back Wall Zipper Pocket / 2 Interior Open Top Item Pockets. Roomy enough to store your daily essentials and make your stuff organized. AFTER-SALE SERVICE: We offer excellent customer service. If you have any problems after purchasing, please feel free to contact the seller by email. We will full refund or resend a replacement bag / matching part ASAP. Choose Dasein, You will get a nice family who will always stand by you! FASHION: Made of high quality pebbled leather which means water resistant. Gold tone and flat bottom studs. 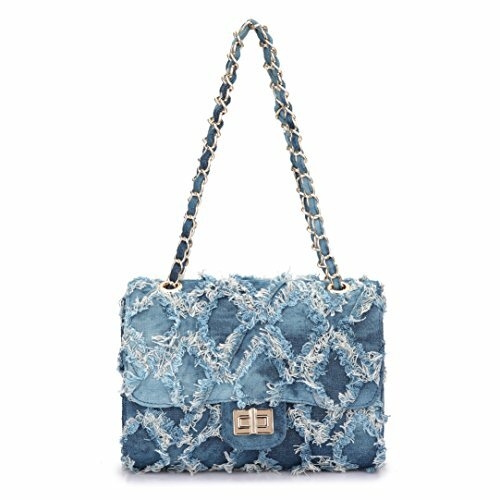 With a decorative padlock and snap up adjustable top, double top zipper closures and fabric interior, you will never want to leave this bag at home. 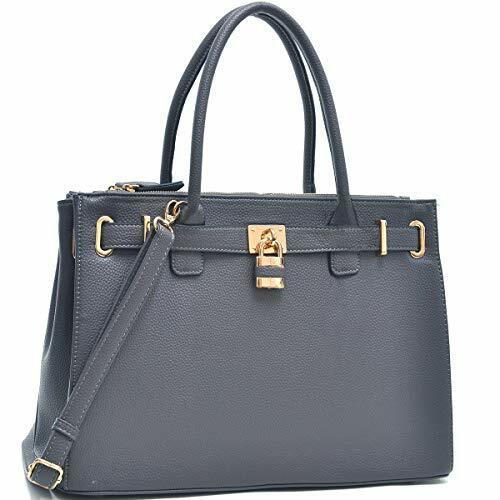 MULTIFUNCTIONAL: Rounded top handles and a detachable adjustable shoulder strap 48'' make you can use it as a top handle bag or a satchel bag. SIZE: 15"W x 10.5"H x 6"D, handle drop length: 6.5". The incredibly spacious design can comfortably hold your laptop, iPad, phone, wallet, umbrella and other things. COLOR OPTIONS: Various color options make it easy to match your outfits. Pair this lovely, soft tote with any look from jeans and boots to dresses and sandals. SATISFACTION GUARANTEE: Perfect to use as birthday gifts, girls, mom, ladies, friends, her. ~Ship from Los Angeles or Amazon Warehouse. FREE Standard Shipping In Contiguous United States. 100% NO RISK Money Back Guarantee. UNEXPECTED DESIGN: Innovative silhouette with top belted padlock deco. Magnetic snaps on the belt can be open at the back to expand the closure. DETAILS: gold-tone hardware, accents and zipper pulls, top belted with a polished lock decoration. 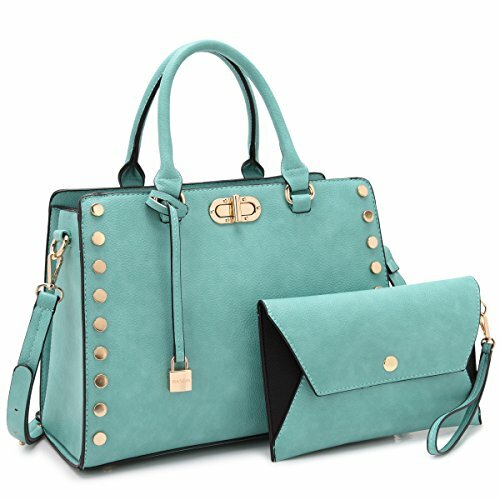 Top zipper closure with dual back magnetic buttons to expand the opening, flat bottom with studs. MTERIAL: made of vegan Saffiano leather. 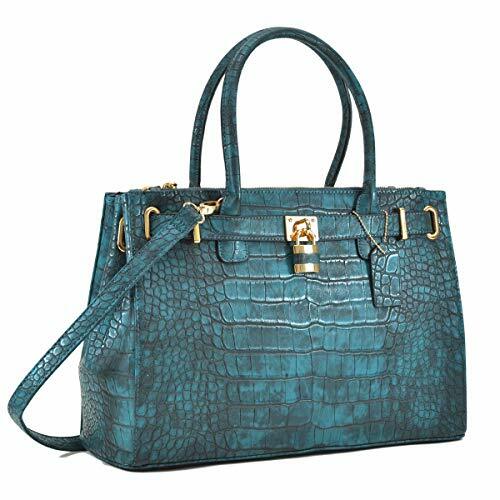 GREAT DESIGN: This bag is made from luxurious faux crocodile skin which features larger scales in the middle that get smaller in size towards the edges of the bag. The exterior is accentuated by gold hardware. 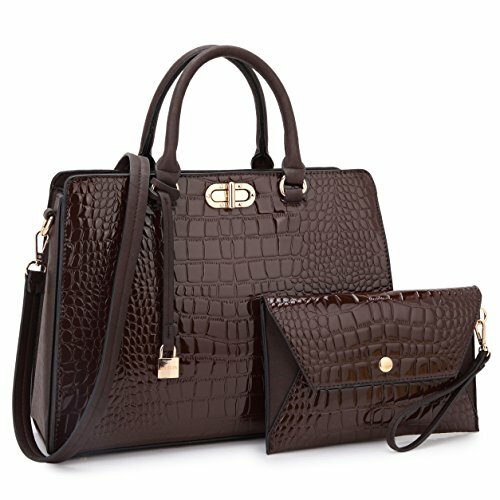 The embossing has the circumflex symbol, which is embossed on all crocodile Dasein bags. GOLDTONE HARDEARE: It's the ultimate handbag in terms of design, craftsmanship, and desirability. The bag has a lock and you can pull down to unlock it. The metallic hardware (the lock, hardware, and base studs) are plated with gold. MULTIFUNCTIOANL: SIZE: 15.7"W x 10.6"H x 5.9"D/ Strap Drop Length: 6.5"/ Shoulder Strap Length: End to End 48''. Can be used as a work purse, fit a 13 inch laptop, ipad, books, files. 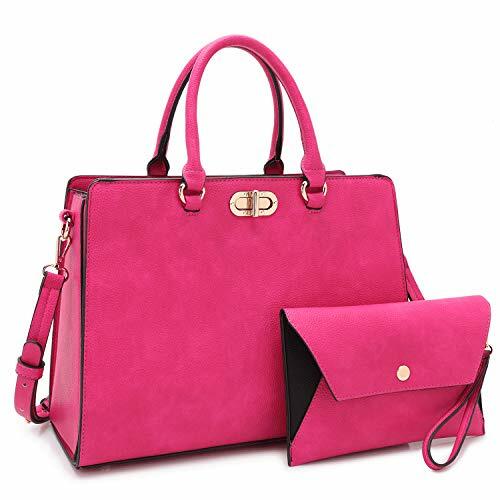 SIZE: 14"W x 13"H x 6"D, wallet: 7.5" x 4.1" x 0.9", shoulder strap: 32" removable and adjustable, top handle drops: 5.5"
What You Get: 1 x DASEIN bag, 1 x matching wallet, our professional customer service. Welcome to contact us at any time. MATERIALS: Pattern Vegan leather (PU) exterior with gold-tone hardware. Interior fabric fully-lined. Matching faux leather shoulder strap, top handle. POCKETS: The main space with 1 central zipper divider and top magnetic snap closure. Interior 1 back wall zipper pocket and 2 open-top item pockets. Extra front compartment with a gold-tone twist lock closure. SIZES: approx. 14"W x 10.5"H x 6.5"D, handle drop length: 5"; Item net weight: approx. 3 LB. Matching wallet: 9.25"x6"; Removable and adjustable shoulder straps available. FEATURES: Top snap closure. The front hanging decorative padlock with Dasein logo on it. Flat bottom with studs. Matching wristlet wallet available. AFTER-SALE SERVICE: If broken, damaged or wrong items received, just contact us and send us a picture, we will full refund or resend a replacement bag/matching part ASAP. If you're not satisfied for whatever reason within 30 business days of the delivery date, we will accept your return request, refund upon returned item. DIMENSION: Bag - 13.5 x 10.5 x 6 IN approx. Wallet (8 slots) - 7.5 x 4 x 0.8 inches. Weight: 2.5 LB. Handles Drop: 5". Shoulder strap is attached (non detachable). Can fit Ipad, wallet, small tablet, make up bag etc. 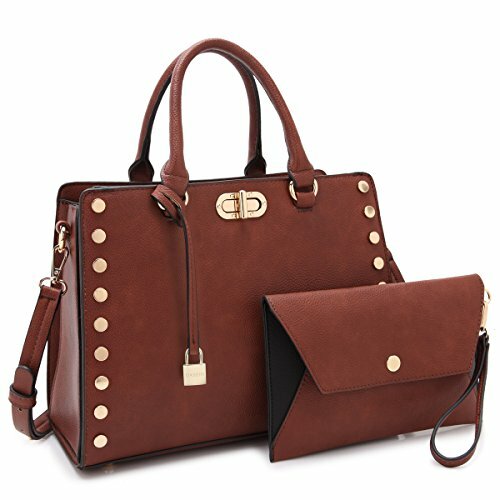 Great handbags set and gift choice for women, ladies. Money-back Guarantee: on all purchased items including any defective products, or ones you simply didn't like. 100% ECO-FRIENDLY VEGAN MATERIAL: high quality and smooth vegan leather. Feel safe to carry this chemical free bag. COMFORTABLE&COMPACT TO CARRY: This bag is just of the perfect medium size to carry. The lightweight and smooth leather make this bag feel very compact to carry either by the top handles or the shoulder strap. VERSATILE TO CARRY ALL: This bag measures: 14"W x 13"H x 6"D, with 5.5" high handle drops and a 32" detachable shoulder strap. Plenty inside to keep your daily essentials like cellphone, wallet, perfume, keys, documents, books and so on. It can comfortably fit a 12" laptop. This bag would be your best choice to carry to your office as a office briefcase. You may also choose a right color for your school, shopping, gathering, travel etc. MATERIALS: Pebbled faux leather (PU) exterior with gold-tone hardware and decorative padlock. Interior fabric fully-lined. Matching faux leather shoulder strap, top handle. FEATURES: Top three zippers closures for three compartments. Flat bottom with studs. Matching wristlet wallet available. SIZES: approx. 14.5"W x 11.3"H x 6"D, handle drop length: 6"; Item net weight: approx. 2.8 LB. Matching wallet: 7.5"x4.25"; Removable and adjustable shoulder straps available. POCKETS: Exterior: 1 back zipper pocket, three zipper compartments. Interior: 2 open-top item pockets and 1 back wall zipper pocket in the central compartments, which let you to organize the daily essential needs better and easier. 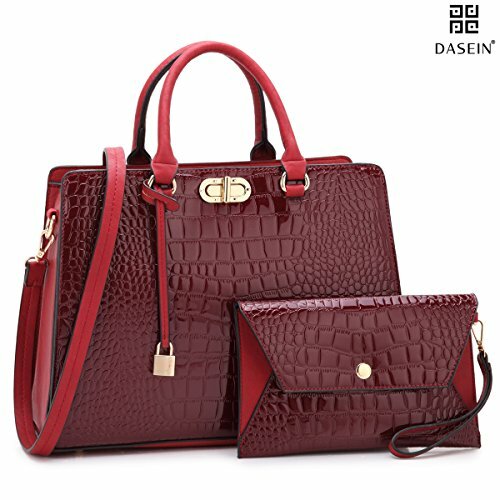 DASEIN Classic Design: Designer middle quilted pattern flap + distinctive twist lock + chain&leather shoulder strap. It's very Functional with multi-pockets. 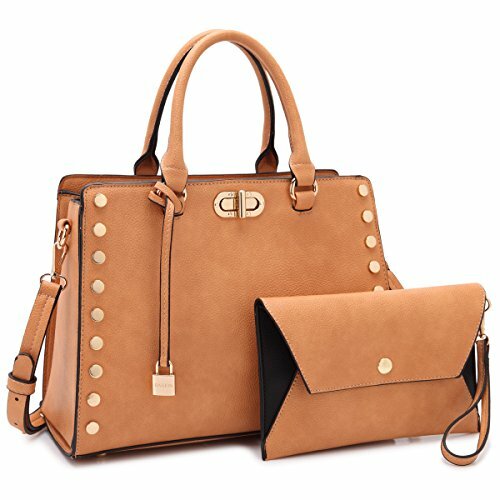 This crossbody collection handbags and purses for women is delightfully soft, trendy which is a lightweight addition to your fast paced day. 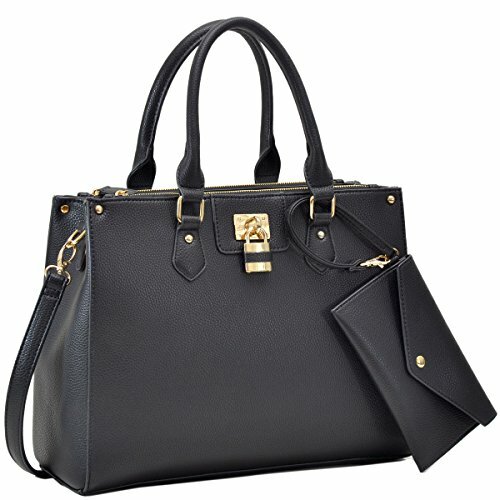 Our signature Dasein-quality faux leather construction with gold-tone hardware give the bag a luxuriously chic look. 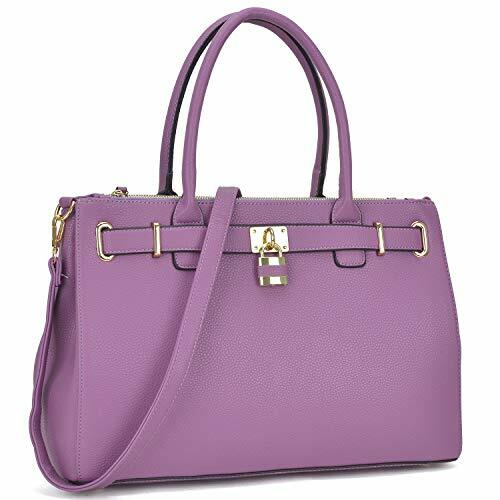 You can't go wrong with this classic and valuable lovely bag. CLOSURE: Top zipper closure, as well as a foldover flap with Twist-Lock closure. MATERIAL: Made from high quality smooth faux leather and fully-lined lnterior. Excellent package with dasein logo. Seriously protect the leather from damage. POCKETS: Two Interior Open Top Item Pockets and Interior Back Wall Zipper Pocket. The leather and chain strap is 42 in long. You can use one strap (drop 20 in) or two straps (drop 11.5 in) which make it as a top-handle bag. Dimension: 11"W x 7"H x 4"D inches. Shoulder Strap Length: 42 IN. Handle drop length: (2 Straps) 11.5'' or (1 Strap) 20''. We suggest comparing its dimensions to a bag you already own to make sure it's just the size you want! MATERIAL: Made of Dasein vegan leather (PU) with pebble textures. Top Magnetic snap closure. Eco-friendly and no animals are harmed. DIMENSION: Bag size- 12.7"W x 10"H x 6"D. Handle drop length: 4.7". Weight: 2.55 LB. Shoulder Strap Length: End to End 48" (Adjustable and detachable). Wristlet Size- 9.3"W x 6"H x 0.2"D. (Fits for Iphone 8 plus). POCKETS: 2 compartments with Center Zippered pouch divider. / 1 Interior Back Wall Zipper Pocket./ 2 Interior Front Wall Open Top Cell Phone and Item Pockets./ 1 Extra Front compartment with a Twist lock closure. Multi pockets to make your stuff well organized. AFTER-SALE SERVICE: If broken, damaged or wrong items received, just contact us and send us a picture, we will full refund or resend a replacement bag / matching part ASAP. If you're not satisfied for whatever reason within 30 business days of the delivery date, we will accept your return request, refund upon returned item. BUY IT FOR HER! Still bothering to choose a right birthday gift for your girl friend or your mum? 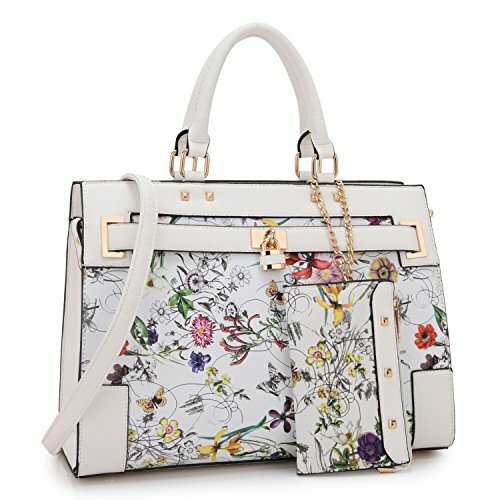 This beautiful bag will definitely delight her with the designer and elegant design. We believe she will love it all. A TIMELESS DESIGN: Get carried away with this signature saffiano leather satchel, now comes with a matching wallet, is a forever favorite inspired by a vintage silhouette. 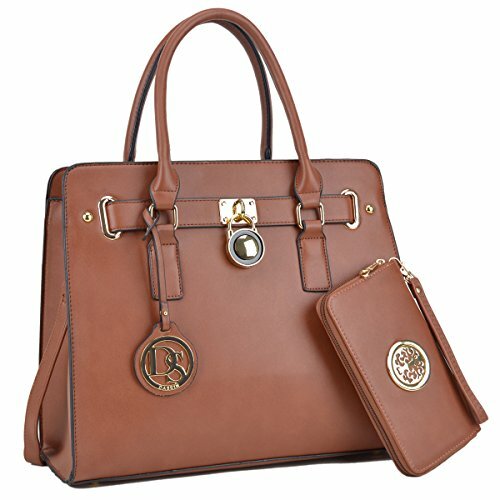 It features sophisticated accents like a leather belting finish with a polished lock. 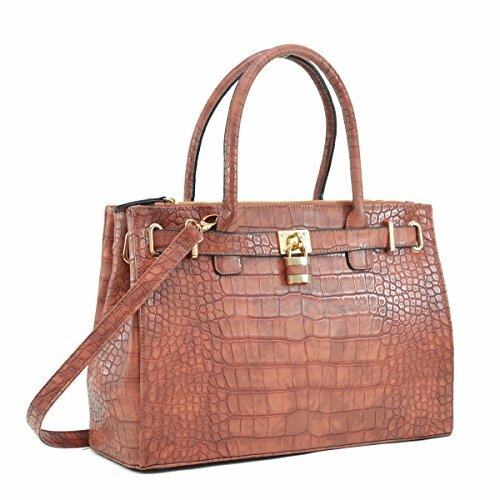 Carry this roomy satchel by the handles to the office, or use the shoulder strap which is perfect for errand running and nights on the town! MATERIAL: Eco-friendly vegan leather (PU) with buffalo leather textures. No animals were harmed. DIMENSION: 14.75" x 10" x 6.5" (inches) with 5.5" handle drop length. Weight: 2.95 LB. It can fit laptop up to 13", tablet, document, book etc. Shoulder strap end to end 50" (removable and adjustable). Come with a matching wallet which can fit iphone 8 Plus. FEATURES: Structured design, can hold its shap all the time. Flat bottom with studs. Top zip closure. Gold tone hardware. Two tone fashion design. Rolled top handles. Belted with a padlock (just for decoration, not functional). POCKETS: Spacious interior features 1 center pocket, two interior top open pouches, and 1 interior wall zippered pocket. 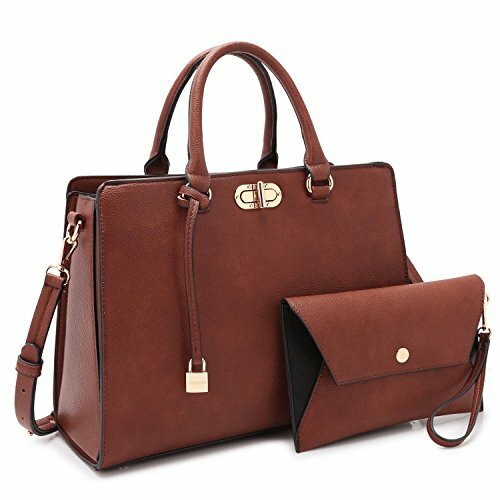 This briefcase style satchel handbag will fit your everything from your wallet, iPad, tablet, and daily essentials. Kindly note, no padded pocket and no exterior pocket. AFTER-SALE SERVICE: If broken, damaged or wrong items received, just contact us (the seller) and send us a picture, we will full refund or resend a replacement bag / matching part ASAP. If you're not satisfied for whatever reason within 30 business days of the delivery date, we will accept your return request, refund upon returned item. Dimensions: 10.50"W x 9.0"H x 3.0"D, Strap Drop Length: (2 Straps) 11.5 or (1 Strap) 20". We suggest comparing its dimensions to a bag you already own to make sure it's just the size you want! Pockets: Two Interior Open Top Item Pockets. Roomy enough for your daily essentials. NO-RISK PURCHASE & SATISFACTION GUARANTEE: 100% NO RISK Money Back Guarantee, your total satisfaction is our priority; **FREE Standard Shipping from Amazon Warehouse or Los Angeles; ** Find storefront of Fashlets, more surprises are waiting for you! MATERIAL: High quality vegan leather material, environmental and no chemical smell. Waterproof and comfortable hand. Smooth and even stitching. Durable gold hardware. POCKETS: One exterior front compartment with a gold-tone twist lock closure, one main zipper compartment with one back zip pockets, one center zip pouch and two slot pockets. 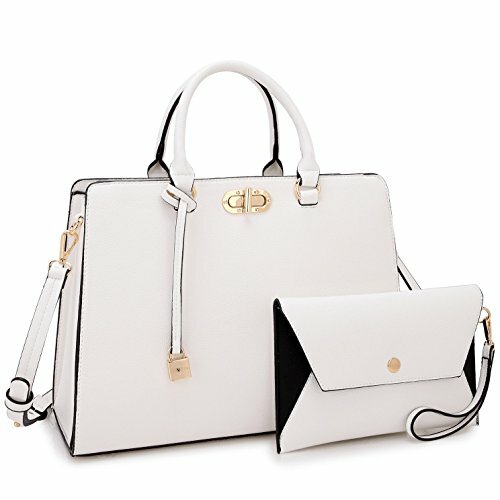 2pcs: One large handbag + one wallet. Structured shape to make your stuff well organized. 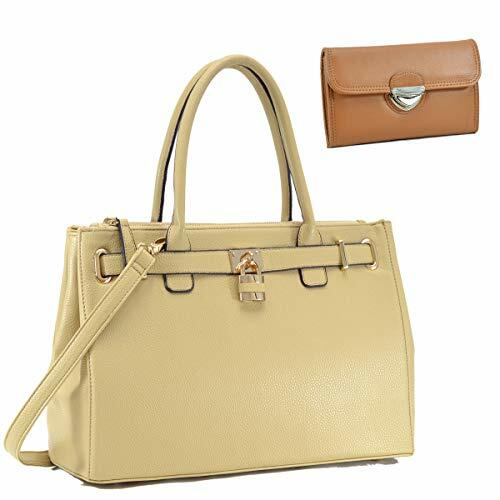 VERSATILE: Gold twist lock in Front, hanging padlock, top snap closure. 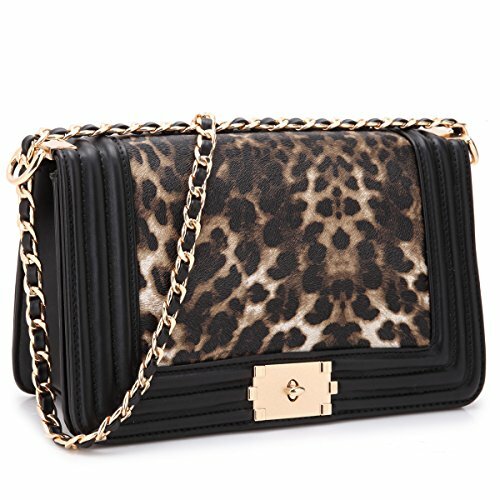 Cross body strap of this handbag is a great add on. It's adjustable and has rotating rings, so the straps will not tangle. Perfect for dating, shopping, working, traveling, vocation etc. MONEY BACK GUARANTEE on all purchased items including any damaged handbags, or ones you simply didn't like. 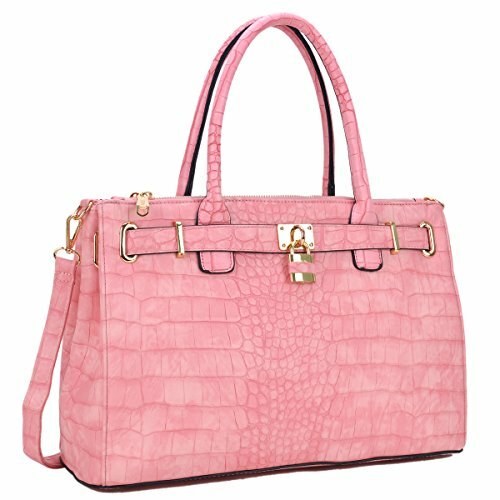 SIZE: Handbag: 14"W x 10.5"H x 6.5"D, handle height: 5". Long shoulder strap length: 45". It can fit laptop within 12", tablet, water bottle, large wallet, snacks, portable charger and phone etc. Wallet: 9.25"W x 6"H.
MATERIAL: 100% eco-friendly vegan PU leather. With saffiano crosshatch leather textures. No animals are harmed. 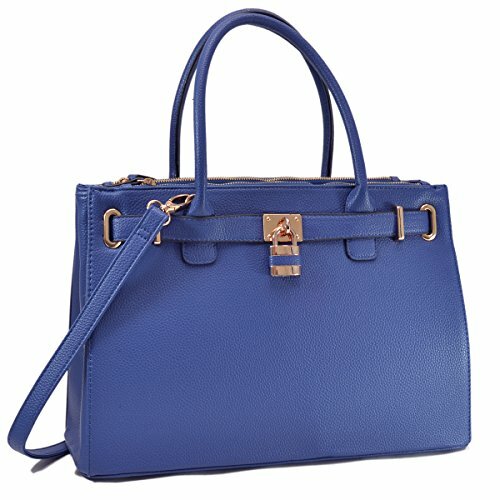 It's normal for a new structured purse to be a little hard. If you feel the opening is narrow, there are two back snaps to help expand top closure. DIMENSION: 13.75"W x 11"H x 6.25"D IN. Weight: 3 lb. Shoulder strap end to end length (Non-detachable): 32" IN. Top handle drop length: 5.5 IN. Can only fit tablet, Ipad, small wallet etc. No padded pocket for laptop. Wallet (7.5"W x 4"H x 1"D) which can fit iphone 7 plus and more. FEATURES: Two tone and flower print design. Fully lined fabric interior and flat studded bottom. Top zip closure. Gold tone hardware. Chain and leather strap (non-detachable).Belt with a decorative padlock (just for decoration). Structured design - can hold its shape and stand up on the table, desk. POCKETS: One Main Compartment / One Interior Back Wall Zipper Pocket / Two Interior Open Top Item Pockets. Roomy enough to store your daily essentials.